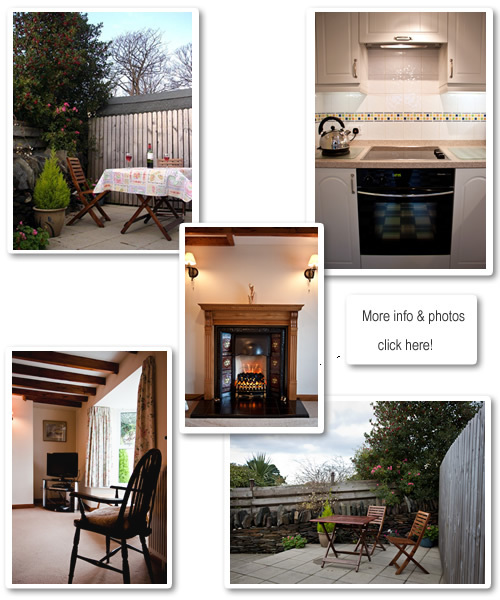 Glen Cottage is a cosy retreat set in the heart of the quiet west coast village of Glen Maye. An ideal base for hiking, cycling, bird watching or just unwinding. Glen Maye with its own national glen that meanders down to the shore past the famous waterfall from which the Waterfall Hotel at the head of the glen takes its name. The Hotel is only 150m from the cottage and serves home cooked meals. The sunset city of Peel with a selection of shops, pubs and restaurants is only 10 minutes drive away as is the beautiful Niarbyl bay with it's restaurant, visitors centre, and views to the south past Eary Cushlin, Port Erin and the Calf of Man. Glen Cottage provides an ideal base for walking, being on both the Raad Ny Foillan coastal path with arguably the best views on the Island, and the inland Bayr Ny Skeddan, which begins at Glen Maye. If you'd like a guided walk, have a look at Go-MannAdventures.com. Also close by is St Johns with tearooms, church, the historic Tynwald Hill, and Tynwald Mills Craft Centre. With mid week bookings available during off-peak periods, you can take advantage of lower ferry fares. Short breaks and long weekends, subject to availability. The cottage is non-smoking and pets are not allowed.